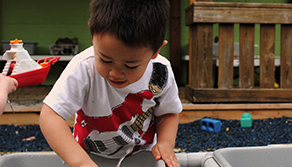 Early intervention is intended for children who have a developmental delay or disability. Eligibility is determined by evaluating the child (with parents’ consent) to see if the child does, in fact, have a delay in development or a disability. 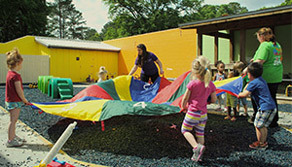 Eligible children can receive early intervention services while they attend The Learning Pavilion. One of the first things that will happen is that your child will be evaluated to see if, indeed, he or she has a developmental delay or disability. The Learning Pavilion Therapy Staff will explain what’s involved in the screening and/or evaluation and ask for your permission to proceed. You must provide your written consent before screening and/or evaluation may take place. The therapy team will be made up of qualified people who have different areas of training and experience. Together, they know about children’s speech and language skills, physical abilities, hearing and vision, and other important areas of development. They know how to work with children, even infants, to discover if a child has a problem or is developing within normal ranges. Group members may evaluate your child together or individually. As part of the evaluation, the team will observe your child, ask your child to do things, talk to you and your child, and use other methods to gather information. These procedures will help the team find out how your child functions in the five areas of development. 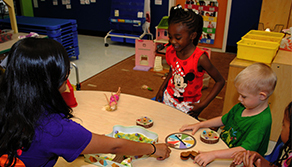 The results of the evaluation will be used to determine your child’s eligibility for early intervention services. You and a team of professionals will meet and review all of the data, results, and reports. The people on the team will talk with you about whether your child meets the criteria under IDEA and state policy for having a developmental delay, a diagnosed physical or mental condition, or being at risk for having a substantial delay. If so, your child is generally found to be eligible for services.